We as a community intend to be more knowledgeable about and more involved in the planning for our area and community. Learning about what local government looks like here and what boards and committees exist is the first step. Understanding the roles of these boards and committees and learning about how planning is done – is pretty interesting! This new Raglan Naturally Focus Area is about bringing all this information into one place and looking at how we can be more involved in planning for our community. If we then want to get into more detail we can learn about the Local Government Act and processes. We can identify the rules, guidelines and Plans and understand the processes of how they are formulated and implemented. A community that understands these things can get more involved and new leaders can be supported. o New Development what new development is happening, or is planned. • We have a district council that is clearly indicating they want to work with a more ‘bottom up’/community led approach to planning. They support our community planning. They are going to develop Blueprint planning for the district and communities which will sit above all other planning. (Bob is there a link we can attach to their proposal yet?) Is it officially available? b) to meet the current and future needs of communities for good-quality local infrastructure, local public services, and performance of regulatory functions in a way that is most cost-effective for households and businesses. c) appropriate to present and anticipated future circumstances. b) perform the duties, and exercise the rights, conferred on it by or under this Act and any other enactment. (e) libraries, museums, reserves, and other recreational facilities and community amenities. (e) a local authority should ensure that the relationship between elected members and management of the local authority is effective and understood. (c) provide relevant information to Māori for the purposes of paragraphs (a) and (b). – The Board is only advisory and is often ignored. The Board should have devolved powers similar to those of Thames Coromandel and should have the same boundary as Raglan Ward. The current Representation Review should be used as an opportunity to campaign for those changes (Consultation closes at 5pm on 1 August). – Is is really possible to work closely with the district council in the way they are indicating? What commitment do we need from the community/community board to build relationships. What systems and processes need to be set up to enable a better way to manage the issues that arise? Challenge is that staff change bring disruption to relationships. – Community Board meetings held in the middle of the day don’t allow for many to attend. Does this need to be reviewed? – Could the community board be operating from the community plan/Raglan Naturally? Could there be specific positions on the board that manage the plan ie. 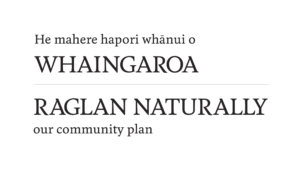 admin/coordinator, planning, comms..
– The Raglan Community Board needs to set aside funds to train and introduce its members about the Local Government Act and their responsibilities. (c) a resolution made by the territorial authority within whose district the community will be situated as a result of the territorial authority’s review of representation arrangements. (f) undertake any other responsibilities that are delegated to it by the territorial authority. A local authority must, in the course of its decision-making process in relation to a matter, give consideration to the views and preferences of persons likely to be affected by, or to have an interest in, the matter. Challenges: Difficulty engaging with WDC hall management staff. Ageing building that the community is outgrowing. Capacity is too small for major events. Opportunities: : We will continue with maintenance and enhancement of the building but restricted for growth as far as it goes as a community facility. As the hall stands at the moment its pretty maxed out. Basic Info: the role of the committee is to manage the Town Hall maintenance and improvements and advise on usage. Budget/income is gathered from a targeted rate which covers Town Hall and Old School Arts Centre at $25 per year per household. WDC (since 2017) takes $30k (from $40k) per year for depreciation. Plus regular rental from WEC, Raglan Community Radio and Raglan Health & Fitness Trust ($6000) Also hall hireage fees which includes regular weekly users and special events i.e. weddings ($4500). Committee members are volunteers. Strength/Asset: The Raglan Service Centre or Library is seen as the Hub of the Community. We provide a safe space for everyone to share including locals, travellers, visitors, professionals and anyone else who wish to share in our space and this is definitely reflected by our team. This branch also oversee Council facilities for Raglan e.g. The Airfield, Town Hall Administrative functions, Cemeteries (Raglan Lawn, Okete Lawn, Te Mata Lawn & Ruapuke Lawn) etc. We provide free Wifi to the community which is available from 8am to 6pm all year round and extends to a radius of 100 meters around our building. The staff within this office are trained in providing the best possible service to our community and with an ever changing world are continually being upskilled to best work for our Community. We are all “Locals” either having been born and bred or long term residents of Whaingaroa. The Team are representative of our Community as a whole from Tangata whenua, farming, local business owner, conservationists, surfers, parents, fishers and life long relationships with the community. Opportunities: With an ever changing face of Raglan we strategically sit in the centre of such a progressive town. Opportunities and support are never ending for our community they need only ask. Basic Info: The Raglan Service Centre (Raglan Library + Council) oversees Council services for the Raglan Community, from providing advice on Building/Resource Consents, Dog Registrations, Council payments, Burial Warrants, Alcohol & Health registrations. Budget is gathered from a targeted rate for the operational cost of the Service Centre. The Raglan Library is also connected to the Council Building and would be the busiest Library within the Waikato District for items issued, received, holds ordered and visitor numbers. We also function as a shared office space for other Council Business staff from HR, Water reticulation, Parks and Reserves Monitoring, Building Inspectors, & Project Management. The Raglan Service Centre attracted approximately 87,000 visitors through our doors last financial year which was nearly 20,000 more than our closest Service Centre within the Waikato. Strength/Asset: A diverse committee with local knowledge and experience and commitment to the RN process. Basic Info: the 9 committee members are volunteers and represent Ngati Mahanga/Hourua, Poihakena Marae Committee, Raglan Community Board, Chamber of Commerce, Whaingaroa Raglan Destination Management Organisation, Whaingaroa Environment Centre, members with community-led development experience and includes Lisa Thomson, our Ward Councillor. The committee sits under the Raglan Community Board as a sub-committee. Strength/Asset: Having a constituent member from Raglan, Fred. This means that there is someone focusing on our catchment and lobbying for projects and funding to this area. – they have previously been elected from east coast, have not have one from west coast for 9 years. (No investments in the west coast – no rates – $ went to harbour planting, sea walls.) This is evident in that we are now getting money for our catchment. Challenges: the majority of councillors are farmers who tend to look after their particular interests. This means one sector (farming) is represented strongly. WRC needs to work with/alongside Waikato District Council to protect Whaingaroa’s environment in the context of ongoing growth and development. Opportunities: the Coastal Plan review is coming up – the entire regional coastal plan (eg. stock/animals should not have access to the coast). Marine reserve – 12 nautical miles? Marine farms? Support the ‘Three Harbours’ Treaty settlements. The harbours are huge part of our environmental landscape. How could the community learn about and support those settlements? Basic Info: Waikato Regional Council is a local government body. “We help communities, industry and other groups in New Zealand’s Waikato region to live and work with natural resources. Our activities help look after our region’s water, soil, air, geothermal areas and coasts – so we can all enjoy these precious resources for generations to come.” See map for the boundaries of the WRC. The people of the Waikato region are represented by 14 elected council members. These representatives work in committees and make decisions and/or recommendations on a variety of matters which are then reported to or decided on by the full council once a month. Fred Lichtwark is our local councillor and with another councillor represents the entire Waikato region/constituency. See map . Challenges: Recent developments in the CBD are all about the same height and of similar appearance. If this continues, some of the attractive variety could be lost. Outside the CBD there are no design guidelines and 2 storey houses are replacing smaller single storey. Some areas such as near the wharf could have buildings of similar size and density to the silos, giving a different character, without detracting from the rest of the town. • Character Statement says, “Maintain wide open streets and a high quality public realm that prioritises pedestrian movement, safety and amenity”. Need to improve, rather than maintain. (e) provide a basis for accountability of the local authority to the community. (d) contribute to the accountability of the local authority to the community. Links to come, visit regional council website in meantime. *please note the link references the 2001 Raglan Naturally Plan. We are currently in the process of reviewing the document for 2019. – The ‘unoccupied’ dwellings on census night have been increasing. Use should be made of those figures to argue for provision and spending based on average population, rather than permanent residents. After all, the baches pay rates, not just the permanent population and they impose peak demands well above average. – The recent Raglan Visitor Infrastructure Study Report (as above) provides the most recent report on visitor numbers. – Future Proof says we don’t need growth beyond areas already planned. – It’s been suggested Raglan could become a Hamilton suburb. We need to look at what need there is for growth, ask what existing residents want and set out pros and cons of growth. – How do we keep shaping Whaingaroa in a way that the community sees it fit; are we being overrun by Auckland and Hamilton? How do we stick to the community values, and how are local people not pushed out by investors/holiday house owners/expensive shops/etc? – Community members are concerned about growth and impacts of. I think its important that we have a clear understanding of this as a community. Would be good to get some stats/data from Clive Morgan, WDC on growth and impacts of. – We have a number of forward thinking architects and experts working in the housing space that can work together to bring leading practices and ideas to Raglan. An opportunity for more collaboration? Can Raglan be a community with innovative housing design – taking into account local housing issues, developers interests, climate change and leading design? – Where are appropriate areas for any new subdivision/expansion? Do we want to limit expansion at least spatially, and if so how? Challenges: Coping with growth, especially in summer peak – already we have queues in shops and on the roads and parking spreads haphazardly along Cliff St, Wallis St, Wainui Rd. We don’t know what numbers might be and we don’t know if water, internet, sewage, power, etc can cope. • Does the current zoning allow for the growth or protection of space that we are needing for future of Raglan? • The example of Mount Maunganui should be borne in mind in deciding on zoning and development rules. In 1950 it looked very similar to Raglan today. Now the Google map shows a very different picture. It has since lost most of its trees and the proportion of building to plot size has grown. Even in 1964 the Mount was a similar size to Raglan now. How does this challenge impact on Local Government & Planning? How does Local Government & Planning impact this challenge? What is the opportunity for us in Local Government & Planning in relation to this challenge?